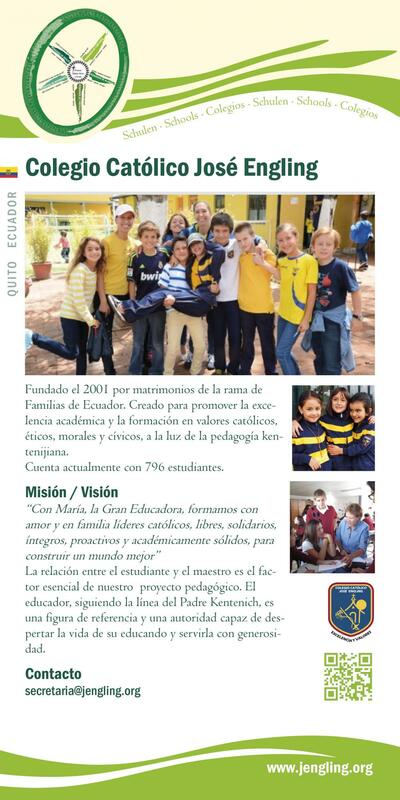 Founded in 2001 by members of the Schoenstatt Family Mo- vement in order to promote a high level of education within the framework of Catholic education, and to cultivate ethical, moral and civic values At present there are 796 students from pre-school to academic high school level. To be an outstanding Catholic, educational family inspired by Fr Kentenich‘s philosophy in order to give leaders to society who have knowledge and firm values at their disposal. The relationship between the students and the teachers is an essential element in our educational concept. Following in Fr Kentenich‘s footsteps, the teachers are approachable while also exercising authority, and are in a position to awaken life and promote the development of the students.